Do you have drummy concrete or render on your building? Is it difficult to access the area where this is occurring? We have an answer to your maintenance needs. Industrial Rope Access Concrete Repair is the most effective and affordable means of maintaining your & carrying out remedial concrete repair projects to any structure. We have experienced, trained and highly skilled personnel, who are constantly at work on structures throughout Australia, carrying out these types of works. 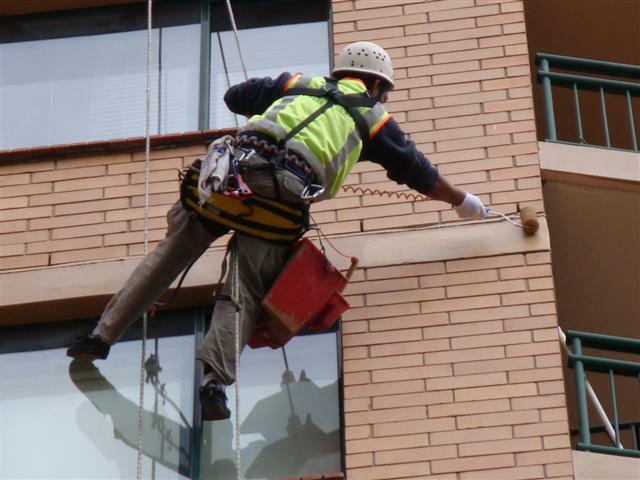 To see how we can assist you with facade maintenance, call us today on 1300 789 474. Advanced Solutions Group – Concrete Repair Specialists. contractor team are today into the second day of a second air riser shaft we previously have successfully completed rendering works to seal the internal brick work where air is going into the building and requires our team to abseil down a 350mm wide gap to carry out rendering to slab band levels and then apply waterproofing coating to the render with structural sheeting on top for longevity. Do you have degraded sealant material in your expansion joins? Water getting in & possibly causing long term structural damage? 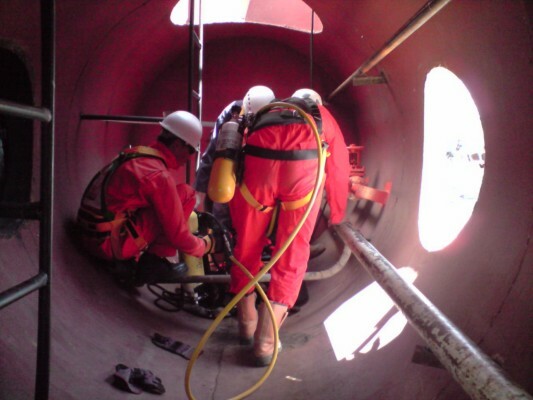 We specialise in expansion joint sealing, particularly at heights or in difficult to reach areas by abseiling tecnhique, or Industrial Rope Access and have literally resealed hundreds of thousands of expansion joins! Remedial Concrete Repair on the Facade of any building is cost effective and easy, using expert abseiling techniques, or industrial rope access as the industry refers to it. Our experienced and highly trained personnel have begun a new project to undertake works in Zetland for a well known remedial building company, to carry out remedial repair to precast concrete slabs and connector plates. Our expert Abseiling Remedial Repair Technician, carrying out works 18 stories above street level, completely enclosed in concrete catch net. Why not call us today for an obligation free quote on any type of remedial buidling services, particularly those in the Industrial Rope Access sector. We can take on any type of maintenance project large or small and we also provide specialised services in concrete repair, painting, expansion joint sealing & other common types of building maintenance works that need to be carried out at heights. If the facade of your building, or any difficult access area needs work, or even needs a survey to ascertain exactly what works may be needed, call us on 1300 789 474 to see how we can assist with your maintenance needs. Advanced Solutions Group – Challenge us….. We Look Forward to It!!!! Painters are often inhibited by difficult access scenarios. We specialise in difficult access painting, concrete repairs and all types of remedial building works. Industrial Rope Access Painting and Concrete Repair is the most effective and affordable means of carrying out many remedial works projects, small and large. The cost of scaffolding alone can often outweigh the costs of doing an entire job by rope access. Why not give us a call and let us supply you with a cost effective means of carrying out remedial building repairs to your property or structure. Our team of expert abseiling personnel are ready to assist you in achieving a positive project outcome. Permanent Fixed Ladders, Access Walkways & Work Platforms form vital parts of any height safety system, particularly in larger industrial applications. Advanced Solutions Group can provide you with all your height safety needs in this area & are able to provide you with obligation free quotes on system installations. Whether it’s a small fixed ladder system, or a large access walkway with all the bells and whistles, we can accommodate your needs. Give our project manager Jim Clark a call today on 1300 789 474. Our expert abseil access personnel have been engaged to provide our services to two internal duct air ventilation risers that go 10floors within the internal of the building, that require sealing works to render and waterproof the internal junctions where air is passing through, with the use of abseil access techniques our industrial rope access personnel can provide this service with a cost effective means within all the safety provisions of work cover and Australian standards. or check out our web site on the top left yellow box.. Paint a Building – It’s Easy With Rope Access! Painting by abseiling or Rope Access Painting, is the easiest way to facilitate painting works on most structures as it reduces access costs and also limits disturbance to tenancy and to the public. We don’t need scaff… we don’t need EWP… we just need our highly trained personnel to abseil your building and apply the paint! Call us on 1300 789 474 to see how we can offer you cost effective painting solutions. Advanced Solutions Group – Challenge Us….. We Look Forward To It!!!!! !